A busload of stranded tourists fights for survival against six infamous serial killers resurrected through an occult ritual. In a dream flashback, drunken redneck Luther kills a neighbor who intervenes while Luther prepares to beat his wife. Luther slashes his wife’s throat before his young son Simon beats him to death with a golf club. Simon wakes on a bus traveling to the Grand Canyon with his brother Brian. Also on the bus are Candi and her friend Nicole, preacher Bill and his wife Daisy, Kip and his sister Jan, goth punk Ren and his girlfriend Star, and a woman named Auntie May. 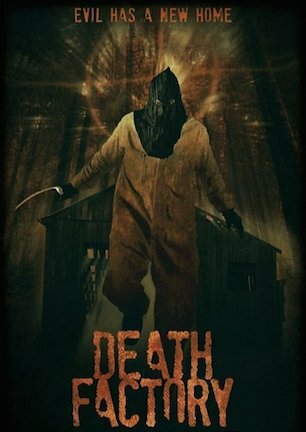 A lawyer named JB arrives at Death Factory, a roadside serial killer museum in a remote location. The attraction is operated by The Collector, who stocks his museum with items belonging to Albert Fish, John Wayne Gacy, the Zodiac Killer, Ed Gein, Jack the Ripper, and Jeffrey Dahmer. When The Collector refuses to sell the museum and its artifacts, JB stabs him. JB then begins a ritual inside the museum using a grimoire and vials of blood drawn from the infamous murderers. The tour bus breaks down, forcing everyone to walk on foot to the Death Factory. JB observes the group from the shadows. Ren and Star go off on their own. When Simon and Kip are unable to find Ren and Star, or anyone who can help, everyone agrees to leave. They return to where the bus broke down only to find that the driver seemingly abandoned them. Assuming that a new bus is on its way, the group returns to the Death Factory to wait. They find a map indicating more cabins on the property and split up to search for Ren and Star. Ren and Star find the grimoire and incant a resurrection spell for kicks. 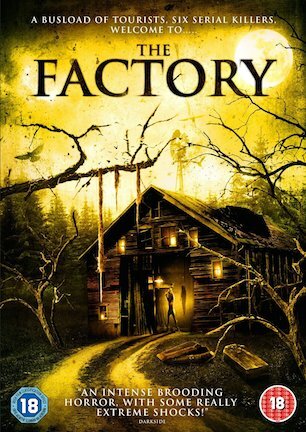 The earth shakes and the serial killers enshrined in the Death Factory return to life. Ed Gein kills Star. Wearing an executioner’s hood, the Zodiac Killer attacks Ren. JB fights off an attack by Albert Fish. Fish attacks Simon, but Simon manages to kill him. Brian and Jan watch in shock as Fish’s body dematerializes before their eyes, just as his spirit seemingly enters Brian. John Wayne Gacy kills Bill. Kip is bitten by Jeffrey Dahmer, chased by Jack the Ripper, and captured by Zodiac. The Ripper chases Candi and Nicole. Nicole pushes Candi so that the Ripper can capture her and Nicole can escape. Nicole runs into JB, who takes Nicole captive and kills her. Zodiac briefly chases Daisy and May. Simon and Daisy find The Collector’s body. They realize that serial killers are somehow returning to life when they find a pamphlet for the Death Factory along with satanic symbols drawn in one of the rooms. Jack the Ripper removes his mask and reveals that he is actually a woman. She briefly seduces a bound and restrained Candi before slicing the young woman’s throat. Simon and Daisy find Bill’s body. John Wayne Gacy takes both of them captive and later tortures them. Simon breaks free, kills Gacy, and absorbs his essence before freeing Daisy. Zodiac chases Brian, Jan, and May, but Jeffrey Dahmer ends up capturing Brian. Ed Gein fights Dahmer over who Brian belongs to. Brian escapes while Gein kills Dahmer and absorbs the other killer’s essence. JB then attacks Gein, but Gein escapes. Zodiac continues pursuing Jan and May. Gein captures May, but she escapes when Gein ends up fighting against JB. JB kills Gein and acquires his power. The Ripper attacks Simon and Simon kills her. Simon absorbs her spirit and realizes that JB has been plotting to supernaturally acquire the serial killers’ strength. Jan and Brian reunite with Simon and Daisy. JB appears, kills Daisy, and stabs Brian. May returns to the group. JB and Simon fight each other until JB finally kills Simon. However, Jan recovers Simon’s dog tags and uses the grimoire to resurrect him. Simon then kills JB. Zodiac appears. Wounded, Kip arrives to help the others set Zodiac on fire. May finds a Maserati and uses it to run over Zodiac. The survivors then pile into the car and escape. The bus driver appears at the scene wearing a suit and seemingly possessed. He recovers the grimoire and uses it to resurrect JB. The driver indicates that there is more work for JB to do. Previously known as “Death Factory,” “The Butchers” released in Europe under a third title of simply, “The Factory.” Go to the Amazon UK order page for “The Factory” DVD and you will find the pull quote “deeply scary, with moments of pure terror!” credited to “Terrornet.com” in the product description. Now enter terrornet.com in your browser’s address bar and you will find a domain name for sale page. Okay. Maybe someone in charge of PR bungled the source’s name and it was only supposed to be terror.net. Guess not. That domain is for sale, too. No bother. A second pull quote, which appears on the DVD’s cover, praises “an intense brooding horror, with some really extreme shocks!” and is credited to “Darkside.” Let’s check out this one instead. What is “Darkside?” Well, it doesn’t appear to be a straight website. Darkside.com is an unused page belonging to an unidentifiable company and darkside.net forbids any access whatsoever. Thedarkside.com and thedarkside.net are both unused domains available for purchase. Maybe “Darkside” is a forum user somewhere? Of the customer reviews currently on Amazon, eight out of 18 of which only afford “The Butchers/Death Factory/The Factory” one star, no one uses that handle. Neither does anyone on the IMDB message board for the film. That can’t be it then. Huh. Perhaps Google can sort this out. Let’s start with “darkside magazine.” Aha! With the tagline of “Britain’s oldest horror magazine,” thedarksidemagazine.com appears to be getting us somewhere! Except, enter “The Factory” in the search bar on The Dark Side’s webpage. Hmmmm. Nothing. “Death Factory.” Still nothing. I went to the Review section and manually searched all twelve pages of entries dating back through 2012, as well as six pages of featured articles, and there is nothing posted for either “Death Factory” or “The Factory,” not even for the John Cusack/Jennifer Carpenter thriller with the same name. I sent a message of inquiry directly to The Dark Side asking for clarification through their Facebook page, but did not receive a response. Back to Google. “With some really extreme shocks” and “darkside” are entered. Nothing but ebay and Amazon listings. Swap out “darkside” for “the factory.” Similar results. Replace “the factory” with “death factory.” Even fewer results. Fine. Given that more than enough time has been spent investigating, I’ll stop short of openly speculating the obvious and leave it at being highly skeptical about these quotes’ validity. At the same time, no one can accuse me of not making a reasonable effort to verify their authenticity, yet coming up with zilch. Critic quote skullduggery is a surefire way to immediately lean me towards assigning a low review score simply on the principle of intentionally misleading consumers. Then I remind myself that you can’t always hold that against the filmmakers, because it may be a loop of distributor desperation that the creators aren’t even in on. So let’s erase the preconception that “The Butchers” is going to be so bad that manufactured press is the only way it can generate praise, and allow the movie to be represented by its content and presentation, yes? The premise of “The Butchers” is that a busload of tourists on their way to the Grand Canyon become stranded in the middle of nowhere and the nearest building in sight is a roadside museum dedicated to serial killer memorabilia. What they don’t yet know is that a mysterious man has just arrived with a spellbook and DNA samples from six of the world’s better-known mass murderers. Once Mister X starts the ritual of resurrection, no one is safe from the ensuing slaughter. While it may seem distasteful to Freddy-Kruegerize a half-dozen of history’s vilest human beings for entertainment purposes, you can’t ever take the movie seriously enough to really see it as genuinely offensive. “The Butchers” is filled with so much ridiculousness as to tease the lines of unintentional comedy, which might please fans of homegrown schlock, but won’t win over appetites hungry for hearty horror. If the movie didn’t name them, you wouldn’t know which infamous killers the actors are meant to portray. Marion Kopf looks more like Philip Seymour Hoffman than Jeffrey Dahmer. Gary Kasper somewhat resembles Ed Gein, aside from being 100 pounds heavier and 30 years younger than his real-life counterpart. The Zodiac Killer wears a plain executioner’s hood. Was it really too much trouble to paint a simple circle and cross on the fabric like the actual Zodiac Killer wore? 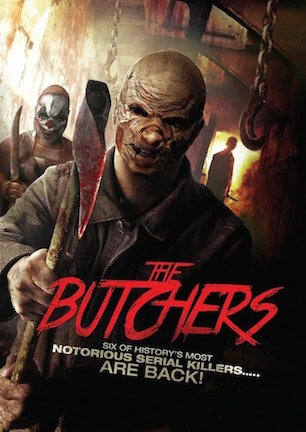 Just to make sure everyone is completely misrepresented, “The Butchers” even reimagines Jack the Ripper as a woman. Some of the actors, such as Randall Bosley playing the backwoods memorabilia collector in denim overalls, fit their roles nicely. Others, like Jeremy Thorsen as the hair-dyed punk, are plainly wrong for the type. Semi Anthony appears to be speaking English for the very first time. There is zero drama in any of his scenes while he is preoccupied with a dialogue exercise to simply recite his lines intelligibly. “The Butchers” puts itself behind the 8-ball from the outset by jamming its cast full with nearly 25 people. That’s a lot of bodies for only 80 minutes of runtime, and “The Butchers” doesn’t know how to juggle everyone efficiently. Continuity goes out the window at every opportunity. With eleven bus passengers on the list to be offed by seven total bad guys, people pair off in weird groupings, reappear in different groups, disappear again, and generally pop in and out of scenes with no noticeable rhyme or reason. Just like the audience, the movie eventually loses track of where everyone is and just throws its hands up in surrender. The finale is particularly hysterical. It’s like someone said to the director, “okay, you have only three minutes of screentime left before the credits, and only two minutes to film it. Hurry up!” Everything rushes to an abrupt conclusion as the final fight begins with the hero ordering everyone to safety while he prepares to find the character named May. Suddenly, a bad guy interrupts by killing one of the other survivors and in steps May to pull the body to the side. Wait, what was all that about needing to find her when she was right there all this time? May is also wearing the wig she purposefully discarded earlier while fighting Zodiac. Apparently Ed Gein recovered it and put it back on her head when she was captured. Continuity flies into the wind on the technical front, too. Time of day changes erratically in sequential shots. Careless sound editing is audible during edits within the same scene. Audio becomes distorted every time the volume raises slightly. The “House of 1,000 Corpses” roadside attraction idea mixed with serial killers isn’t a bad starting point for a senseless slasher bent on being more unashamedly fun than truly terrifying. If the film wasn’t so unpolished technically, I might award it points for being, frankly, not as bad as I presumed. Buried beneath inconsistent acting, cinematography, audio, and everything else, beats the pulse of a production with intentions of entertainment in its heart, but without the professional edge to bring it together cohesively. November 7, 2014 by Ian Sedensky.